You work hard in the gym to push your muscles, and you know protein is crucial for muscle support. 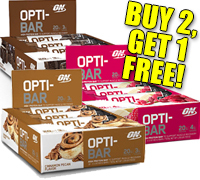 Reach for ON’s new Opti-Bar anytime you want premium protein to help fuel muscle recovery. The latest innovation from Optimum, the sports nutrition industry leader and maker of the world’s #1 whey protein, takes quality and taste to a whole new level. Ingredients: Protein Blend (Milk Protein Isolate, Whey Protein Isolate), Isomalto-Oligosaccharide, Almond Butter, Semi-Sweet Chocolate Chips (Cane Sugar, Unsweetened Chocolate, Cocoa Butter), Glycerin, Natural Flavor, Maltodextrin, Cocoa Butter, Erythritol, Chocolate, Sea Salt, Cocoa (Processed With Alkali), Stevia Extract.